“Trans-human” literally means “beyond human,” exactly what the movement pushes towards. As an international cultural and intellectual movement, trans-humanism is working towards transforming the human experience through biotechnology, robotics, artificial intelligence, and radical science. The imaginative applications of the current technologies and future advancements are limitless, and both scientists and intellectuals are already envisioning a different society. One such intellectual is philosopher Rebecca Roache. Roache leads a team of scholars at Oxford University in revolutionizing the future of punishment through science. In line with the trans-human movement, Roache and her fellow scientists are planning to utilize trans-human advancements in the allocation of punishment. In her work, Dr. Roache cites Dr. Aubrey de Grey, cofounder of the anti-ageing SENS research foundation. Dr. Grey believes that soon we will be able to slow down, if not halt the ageing process all together, enabling humans to remain healthy and live out thousands of years. Dr. Roache, who does not shy from bold statements, proposes, “in cases where a thirty-year life sentence is judged too lenient, convicted criminals could be sentenced to receive a life sentence in conjunction with lifespan enhancement.” And, the expense for society, she argues, would be balanced by the increased contributions of a longer-lived workforce. In the future, Roache predicts altering of perception of time will go beyond external factors and instead, will be controlled by psychoactive drugs. Psychoactive drugs already slow down the perception of time for users. Scientists are now claiming future biotechnology will allow for prisoners’ minds to trick them into thinking they have served a 1,000-year sentence. For Dr. Roache, the safety of current prison officers is a limiting factor in how ‘unpleasant’ prison can be made for inmates. In order for the prisoners to be managed safely and calmly they must be ‘relatively content.’ Therefore, through the substitution of robots for prison guards, the limiting factor is removed and possibilities for making punishment worse become viable without endangering prison staff. 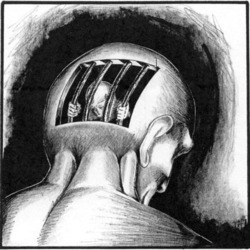 Roache claims that it is the unfamiliarity of tinkering with the brain that “spooks us.” But, given that the U.S. is fairly familiar with cases of extreme injustice, torture, and racial and socioeconomic disparities in implementing punishment, providing it with yet another tool seem far from unfit.